Compare discounts for Hotels Motels Resorts in Galveston, Texas! The City of Galveston is located on the upper Texas coast of the Gulf of Mexico on a 32 mile long island located two miles off the Texas mainland. Since 1839 Galveston served as Texas principal port and gateway to the Southwest and is still serving as such today. Strand Historic District with countless shops, galleries, restaurants, museums, and historic attractions is the main attraction in Galveston. The area has a late 1800's and early 1900's romantic charm and is also the center of Mardi Gras celebrations and Dickens on the Strand festivities. Note: Lists are not identical. 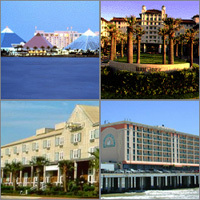 Different sites offer different accommodation options for Galveston. The Hotel Galvez is overlooking the Gulf of Mexico, just across the boulevard from 30 miles of sun-drenched beaches. Overlooking the Gulf of Mexico and Galveston's Famous Sea Wall, the Galveston Island Hilton offers an ideal location for both business and leisure visitors. Harbor House is a modern day translation of a working waterfront warehouse, recreated as a charming Harborside Inn on Galveston. The La Quinta Inn Galveston is a first class hotel located 4 miles from Scholes Field Airport. The Victorian Condo Hotel offers suites exclusively, each with private balconies overlooking the Gulf of Mexico. Choose from a 1 or 2 bedroom condos with queen size beds, bunk beds for the kids and a fully equipped kitchen. The Beachcomber Inn- Galveston is a first class hotel that is located one block from the seawall and 45 miles from downtown Houston. The hotel's convenient location is ideal for those visiting the area and it's many attractions. The hotel is only one block from the beach and offers an outdoor pool for those wanting to enjoy fun in the sun. At Days Inn Galveston, you are offered a choice of either a room with a king size bed or a standard room with two queen sized beds. All rooms carry HBO, CNN, and ESPN. Also, Refrigerators are available upon request. A wave of relaxation washes over you as you enter on winding, tropical Hope Boulevard, the hassles and deadlines of your daily routine fading to a distant memory. The Ramada Limited Galveston offers beach front location only minutes to all attractions, restaurants and shops. Dazzling old world charm in the heart of Galveston's Strand Historic District, the elegant European style Tremont House hotel, built in 1879, is flawlessly restored and sparkles like a precious gem amidst Galveston's famous collection of Victorian architecture. The Galveston Best Western Beachfront Inn is a tourist class hotel located on the Seawall and near many of the area attractions. The U.S.S. Flagship is located on Galveston Island's Pier. The pier based hotel stretches 1000 feet out to sea, capturing a panoramic view. Comfort Inn Galveston offers beach front location only minutes to all attractions, restaurants and shops. Beautiful eight-story hotel with a tropical island atmosphere. About 3 miles from the cruise terminal, this Galveston hotel is also a half-mile from the Galveston Island Convention Center.